Absolutely fascinating article from the NYT on the ‘creative apocalypse’. The idea that the internet is undermining creative industries with freebies is still going strong, but Steven Johnson makes a compelling argument that the creative people behind these industries are doing just fine — thriving in fact. It’s the big companies and conglomerates that are struggling. I’ve been thinking about this quite a bit recently, and strongly believe we’re living through a creative revolution not a creative apocalypse. Johnson’s article completely nails the point. Anyone interested in how artists’ livelihoods have been changed by technology and the internet should give it a read. 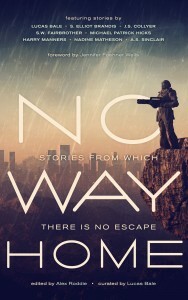 Launch Party for No Way Home! We’re having a launch party for No Way Home on 2 March. You can RSVP here. 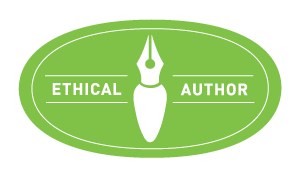 The contributing authors are going to be chatting about their contributions, and there’ll even be some book giveaways (much better than nibbles). Sound good? Of course it does. I’ll chat to you all there then! Thanks to Michael Patrick Hicks for the nomination. 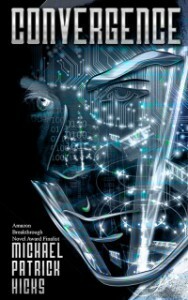 Mike’s debut novel Convergence was an Amazon Breakthrough Award 2013 Quarter-Finalist, and is a fantastic dystopian read. Mike writes the kind of futuristic page-turners that are not only action-filled, but also get you asking the big questions about the nature of humanity. 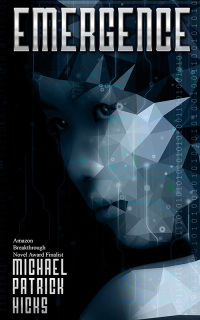 I was lucky enough to beta-read for his second novel Emergence, and regular readers of my blog will see more about his work here soon. I enjoyed both books so much that I asked him if he’d be willing to let me pepper him with questions about them, so keep an eye out for that. He’s also the author of short story Consumption (which I really must read, because I’ve enjoyed his others so much) and Revolver. Revolver is a story in the No Way Home anthology which features some of the best up-and-coming speculative fiction writers working today (including me: brag brag). But seriously, No Way Home is a fantastic set of stories. I thoroughly recommend it, and not just because I’m in it. No Way Home is due out on 2 March so watch this space. First breaking of the rules (or at least bending a little), I’d also like to mention my fellow nominees Lucas Bale and S. Elliot Brandis, as well as J.S. Collyer who nominated Mike. They’re all authors well worth taking a look at. 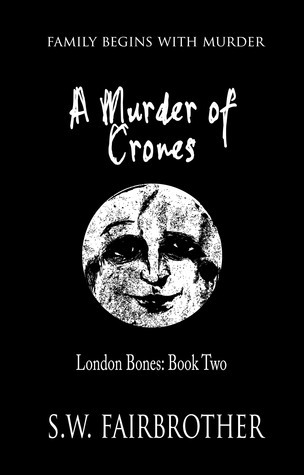 London’s famous werebees are about to select a new queen, but just at the most politically sensitive time, one of their own goes missing and returns three days later with no memory of where he had been or what had happened. Second breaking of the rules: I am a terribly disorganised writer. I write scraps and bits as they grab my attention from all over the story and then only decide later what order they go in. (Makes me sound great doesn’t it?). Like many people, merely being around the police was enough to make me feel guilty. It didn’t help that the last time I saw Zee Haddad she’d given me a thorough dressing down. I shifted in my chair and tried to look innocent, or at least authoritative. This was my territory after all, and the werebee had come to me. Zee sat in the client chair opposite mine, an untouched chamomile tea in front of her. We’d covered all the basic pleasantries — the how-are-yous, the miserable autumn weather, the tube delay that had made her fifteen minutes late. I’d provided her with a beverage. Then we’d chatted about my promotion to manager at the Trust. We were half an hour in, and I was still waiting for the reason she was sitting in my office. I leaned back in my chair and studied his face. He wasn’t a conventionally attractive man. His face was a little too round, and the last of his hair made a Saturn-style ring around most of his head, but there was an intelligence to his eyes that made up for the lack of physical beauty. I could see why she liked him. What I couldn’t see was how he could be so blase about what happened. My internal weirdometer was pinging like crazy. Normal people don’t lose three days of their lives and just shrug it off. Despite the weirdness, I thought he was telling the truth. Anyone with the brain power to become one of the country’s leading fertility experts would also have the brain power to come up with a better lie. It was just a damned odd truth. My first nominee is W. Freedreamer Tinkanesh. W’s writings have appeared in unknown, obscure zines and in the last ten years in various anthologies: ‘Write Now’ (UK, 2001), ‘Threads’ (UK, 2009, edited by Cassandra Lee aka Shawn-A-Lee McCutcheon-Bell), ‘Eclectica’ (2011, edited by Andrea Dean Van Scoyoc), ‘No One Makes It Out Alive (2012, edited by Hydra M. Star), ‘Blessings from the Darkness’ (2014, edited by Kelly J. Koch), ‘Ladies and Gentlemen of Horror 2014 (edited by Jennifer L. Miller). W. Freedreamer Tinkanesh is the author of the novel ‘Outsider’ (2012) and the collection of short stories ‘Tales for the 21st Century’ (2014). Walki’s novel Outsider is one of the most original books I have read in a while and I thoroughly recommend it. Connect with W. Freedreamer Tinkanesh on: Livejournal, Twitter, Goodreads. My second nominee is Heather R. Blair, who readers may remember did an author interview for me a little while back. Heather writes fantasy and paranormal fiction, including Shivers, a collection of (shivery) short stories, the Celtic Paranormals series of novels, and Phoenix Rising. I’m very much looking forward to seeing what she comes up with next. Connect with Heather: Website, Goodreads, Facebook, and Twitter. I may have another nominee coming, I’m just waiting for her to let me know she’s happy to accept the nomination. Watch this space. The January Author Earnings report is now out, and once again it makes for fascinating reading. I’m not going to rehash it here, the report goes into plenty of detail. 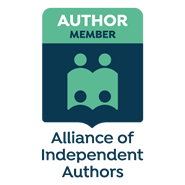 Definitely worth taking a look at by anyone interested in indie publishing and the changes in the ebook market.